Dimples & Dragonflies Studio & Gallery LLC: Sentiments Of A Southern Artist: "Back At The Easel"
Sentiments Of A Southern Artist: "Back At The Easel"
Yes, It's Been Quiet Here At Dimples & Dragonflies. Autumn Is My Most Productive Season At The Easel, And This Week I've Been Back Trying To Redefine My Stroke. Ironically, It Seems When I'm Away From My Oils For Any Extended Period Of Time..My Brush-Hand Has To Reintroduce Itself To The World Of Paint And Rhythm. Ahh ~ Being Back Where I Truly Belong..Well All I Can Say Is Life Right Now Doesn't Get Much Better! Oh, what a sweet painting. It looks as if you got right back into the swing of things. So sweet. 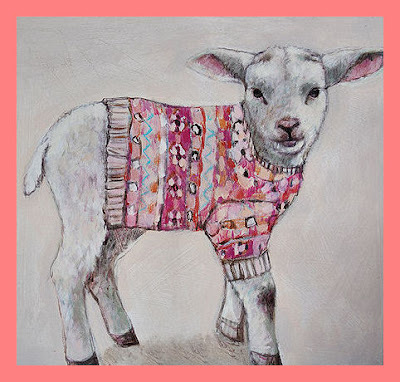 What can you say about a lamb wearing a sweater except "Wear Wool!" :). Terri, just catching up again on my blogging and I love your lambs and children work. So glad you are enjoying the fall and getting back to your easel! Blessings to you! !